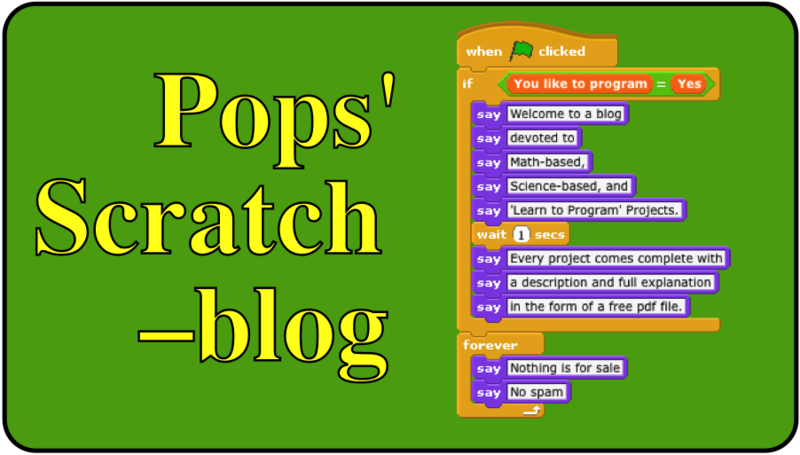 Every programming language has a method for generating random numbers and Scratch is no exception. Load Scratch, look in the green Operators menu, and you will find a pick random block. Drag a (pick random) block into the scripting section. Continually click on the block and it will report a string of numbers, 1 though 10. Change the 10 to 6, click on the block several times and note that the numerical results are similar to what you would obtain by rolling a single die. The pick random block actually generates pseudo-random numbers. Since every operation in every programming language has to be based on algorithms, Scratch, like every other language, must contain an algorithm (the antithesis of a random process) that generates numbers that 'look like' random numbers. Hence, the term pseudo-random numbers. A popular class of algorithms that generate pseudo-random numbers are called linear congruential generators and constitute a major topic in contemporary mathematics. If you are interested, request the Linear Congruential Generator.pdf, a four-page document that works through the mathematics and provides a Scratch script that implements the Park-Miller parameter set. Psuedo-random numbers, hereafter called random numbers, are fun to play with and Scratch (or any other programming or scripting language) provide students the opportunity to develop dynamic solutions to many types of mathematical problems. Here's a problem in geometrical probability. Consider a square is divided into four smaller, congruent squares. The square in the upper right has been shaded. The following Scratch block, used in a Repeat block, can be used to generate 100 random points in the above square. How many of the 100 points would you expect to fall in the shaded square? 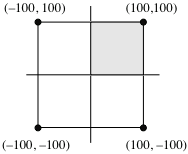 One could argue that since the four smaller squares are congruent, the area of the shaded square is one-fourth the area of the large square. Since the probability of picking any point is equal to the probability of picking any other point, the expectation is that 25 of the100 points, or one-fourth, would fall in the shaded area. As you readily see in the graphic shown below, this problem is easily modeled in Scratch. The red circular sprite, sprite 1, is used to plot each random (x, y) point. A yellow sprite, sprite 2, is a square with one-quarter the area of the large square (see left screenshot below). Since the yellow square is a sprite, you can click on it and move the yellow square around (see screenshot on right) within (or even outside of) the larger square. This makes the problem dynamic, as compared to the static example given at the beginning of this lecture. When the program is executed (click on the green flag) 100 trials of 100 random points are computed and averaged. As you can see in the left screenshot, the average for the 100 trials is 25.27. The average for the screenshot on the right is 24.62. Both averages are close to the theoretical value of 25. 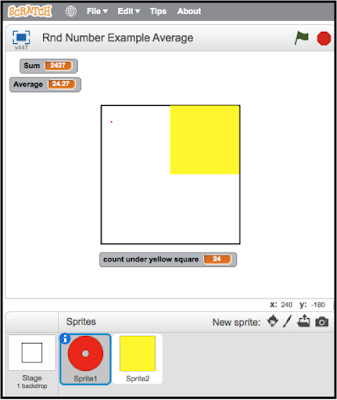 Great article regarding the usage of random no.in scratch.Many of us dint know about the proper utilization of it,you have helped us a lot. Where Do Random Numbers Come From?